Only member with the global leadership achievements are bestowed and entitled to this Award Designation. If a member is recognized either through the Global Leadership Awards, or through globally recognized works, ALDA will confer the Distinguished Member Award Designation. 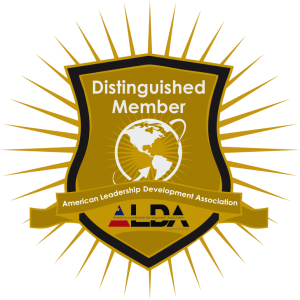 Distinguished Member have the official Title of Distinguished Member American Leadership Development Association with a post nominal of DMALDA. They are allowed to use the DMALDA award logo on their websites and social media and are provided a soft ID card. DMALDA Member will have access to each other as the exclusive group of Influential global leaders, and to the Élite Mastermind group to grow your businesses and impact even further. Free member have access to the leader’s blog, online The Leader’s magazine and can view the directory without contact information.